These living collectives are made up of multiple Possessors, and can drain life from anything they touch. When dealt lethal damage, the collective splits into individual creatures, so be prepared to face them. 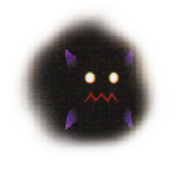 The Massive Possessor is a Pureblood Heartless that is found in Kingdom Hearts 358/2 Days. It is a collective of Possessors acting as one creature, and will split into its components once defeated. The Massive Possessor is a large, gaseous creature that bears some resemblance to the Darkball Heartless, sporting a similar, jagged mouth—albeit the Massive Possessor's is red—and glowing, yellow eyes. It is seemingly made up of black and dark blue and purple shadows. The Massive Possessor's name clearly references its size, as well as its ability to possess inanimate objects. Massive Possessors are more of an annoyance than they are a challenge. They have very little HP, and can be defeated easily through offensive magic, or even a physical attack. They will float around Roxas, however, slowly draining his HP. Dodge Roll can be used to escape this tactic. These Heartless will then proceed to split into several Possessors once they are defeated. This page was last edited on 3 May 2018, at 17:01.